The suspension has the mission to the irregularities of the road does not reach the body of the vehicle or welcome to do so as possible. For this, between the wheels and the frame is placed an elastic means to deform the vehicle weight and the inertia thereof to be raised or lowered as a result of the irregularities of the paving. Verification of all components of the suspension. Inspection of dampers and opinion on life. 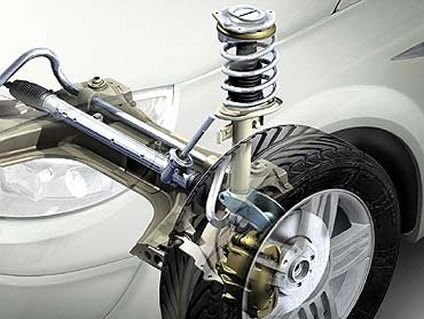 Recommendations and symptoms: To ensure comfortable handling, even under adverse conditions of the terrain, review the suspension components to detect early faults and wear to avoid uneven wear of the tires. The characteristics required for efficient operation of the direction leading to driving safety and driving comfort. The flexibility of the mechanism, the quality of the materials and the ability to bring driving safety. Screening and diagnosis of steering system. Replacing the power steering fluid. Adjusting bands fluid pump direction. Recommendations and symptoms: Keep your vehicle operating smoothly changing the power steering fluid at the recommended frequency and duration will increase the steering system components.